Anonymous, 11 Dec 2012i had my ace 2 recently , not all apps worked , but i really liked it , but the only thing tha... moreZooming is a unuseful function because its Virtual, don't improve quality..
Getting this phone tomorrow. :?) Is it now android 4.1? Does any body have a link to the custom ROM for this phone? Any info on how stable it is? Just wanna confirm, this phone supports flash, yes? Rasi, 12 Dec 2012Can update JellyBean now?I bought galaxy ace 2 I8160 for 2 wks now, can it really upgrade to android 4.1? guys.. is the ZSLK2 the latest software update for ace 2 or DXLK2.. im confused >. You must try to zoom your camera by the volume i think?!!!! Rasi, 12 Dec 2012Can update JellyBean now?I don't think we can update it this year, probably next year.. The OS update has not been finalized yet.. No announcement yet! Anonymous, 11 Dec 2012LOL! I'm also choosing at that 3 phones if which is the best for me! I want to buy one for xma... moreI think you should buy the ace 2 because it is really good and really fast. Had it for a month and never going back to my other phone! JBCM, 10 Dec 2012Camera Zoom FXCan update JellyBean now? i had my ace 2 recently , not all apps worked , but i really liked it , but the only thing that i didn't like it is the zoom think .. no zooming ! Anonymous, 11 Dec 2012LOL! I'm also choosing at that 3 phones if which is the best for me! I want to buy one for xma... moreIf you ask me..well if i got the budget for s3 or s advance.. i would go for S Advance youll never go wrong with that phone..for s3 mini and Ace 2 my money would go for s3 mini its JB already so no need to upgrade..Ace 2 would be my last option..but then again if you have the budget. Anonymous, 10 Dec 2012Yes, with Corning Gorilla Glass Protection. http://en.m.wikipedia.org/wiki/List_of_devices_wit... moreWow..thanks for the info sir..thats sure gave me peace of mind. is the sns integration important on a phone?? Mr. Fish, 10 Dec 2012I'm having a hard time choosing between Ace 2,S Advance, S3 Mini..but i think i can only affor... moreLOL! I'm also choosing at that 3 phones if which is the best for me! 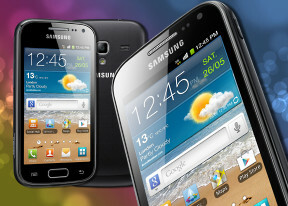 I want to buy one for xmas :) what do you think is the best the s3 mini or ace 2 or the s advance?